With all the work that has gone into delivering the highly accomplished and lead teacher classifications, it would be easy to lose sight of the significant work that continues to be done to ensure access to experienced senior teacher (EST). The EST classification was first won in EB6, and QTU negotiations in EB8 achieved significant changes, most notably the reduction in eligibility requirements. Initially, four-year trained teachers were required to complete four years of full-time equivalent service, or seven years of full-time equivalent service for three-year trained teachers, at the senior teacher classification to be eligible for EST. However, as a result of negotiations in 2016, applicants in the 2018 round were eligible after completing three years of service at senior teacher, or six years for three-year trained teachers. From 2019, eligibility for applicants reduces to two years of service as senior teacher, or five years of service for three-year trained teachers. EB8 also secured agreement on a review of the process, which has resulted in a simplified application procedure. The QTU is committed to the continuation of the EST classification and application process in the next EB negotiations. Members who applied in the 2018 round will have been notified of the outcome of their applications in term three. The QTU understands that over 90 per cent of applications in the recent round were successful. This demonstrates both the outstanding quality of Queensland’s state school teachers and the reliability of the application process, which includes a statewide moderation panel with QTU representation. Arising from the 2018 application process, the QTU has been able to achieve further guarantees from the department. Several applicants in the recent round were deemed ineligible to apply for EST, based on the number of years of service that they had been employed as a senior teacher. In some of these cases, members were seeking to relinquish their rural or remote school leader position to enable a relocation for personal or family reasons. The initial ruling was that, while the employees had completed service for the number of years required, such service was often in the role of a school leader, not a senior teacher. The department therefore deemed the employee ineligible to apply for the EST classification. The result of this ruling was that, if the members relinquished their school leader position, they faced a wage cut of more than $25,000 per annum. The same eligibility requirements have also been applied to teachers transferring to Queensland state schools from other jurisdictions. That is, transferring teachers have not served as senior teacher for the prescribed length of time. This has similarly meant wage cuts and makes Education Queensland a less attractive employer at a time when the state faces shortfalls in its teacher workforce. The QTU has reached agreement with the department that employees in promotional positions either relinquishing or relieving below level will have access to the relevant salary, either senior teacher or EST, subject to years of service and satisfactory performance. Additionally, employees from interstate can access EST provided that they can demonstrate that they have met the relevant years of service, complete the two-page application process, and have their application verified by their supervisor and reviewed by a Queensland panellist. 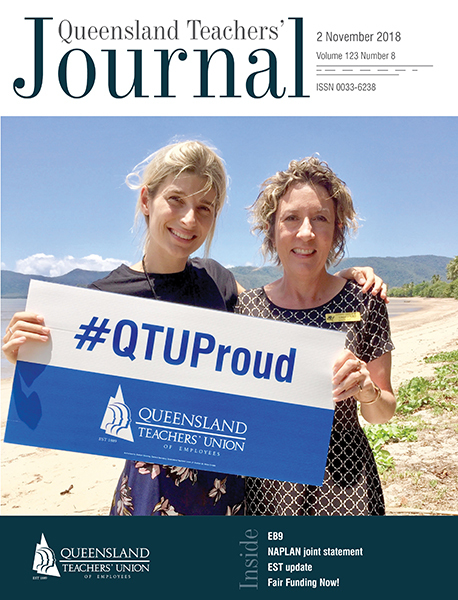 At the time of writing, the QTU envisages an exchange of letters between the QTU and the department, acknowledging the agreement has been reached and including a commitment to incorporate such changes into EB9.